My Lord, Please Sanctuary Me: A New Year, a New Direction, and a New Meow! A New Year, a New Direction, and a New Meow! I cannot believe how long it has been since I have posted here, but there are several reasons I have not. As I mentioned before, I started another blog about our rabbitry and I began to keep detailed records of breedings, births, weights, genetics, and so forth. I spent hours making charts, reading, and learning. I had to urge my husband to build at least two more cages, but I really want about four more...or more. I had bought quite a few rabbits because most of what we had left are old, but I was pleased to see that my old does are still healthy and fertile. Still, we are phasing out one breed and will be focusing on another. We have not even culled one rabbit since the beginning of this breeding season as we were trying to sell off as many as we could to compensate for the cost of buying young purebreds for breeders and waiting for them to develop. I also am spending more time with my rabbits, handling them, feeding them by hand and, of course, cleaning. (These days, I so much enjoy being outside whether with my buns or plants.) I wish to develop a reputation for not only our purebred rabbits being healthy and good quality, but also for their docile temperaments. My husband is very pleased that I finally am involved with them as much as he wanted me to be from the start—not like I was not busy enough with the Princess and homeschooling. However, we cannot expand or advertise much because we do not the acreage to comply with our county's requirements, so we are doing things low-key for now as we are also actively looking for land outside of our present county, which is on a mission to drive farmers out by rezoning their properties when placed on the market to be sold. We are looking in neighboring counties to the west or ones farther north that are farmer-friendly. On Sunday, we walked a lovely 64 acres with a stream that has a low price per acre, but would be too costly for us to buy it and then build what we want. We walked to see how we might sell off up to half in two 10 to 15 acre lots because it has two road fronts on the front and back of the property. The side I like, the higher part of the property, is on the busier front road, but my husband was hoping for the quieter back side that slopes down closer to the road than the other side. The stream is also closer to the back side. The other disadvantage is that it does not have many hardwoods, as the owner is a forester that harvests the pines, some of which could also be sold and provide us with some extra funds, I suppose. We are looking at land because we are probably going to have to build. There are just very few houses that have old fashion large farm kitchens with space for a full size freezer and a full size refrigerator and space for a grand piano somewhere with nice acoustics that are not like mini mansions, which would be just too much house for us. We just need a customized plan that will fit our lifestyle and plans. My husband was also thinking of going into business for himself, but I felt the Lord was telling us that we would have another choice that we could make, but no direction of which we should take yet. Just this week, my husband applied for a newly created position within the company he works...the job he was originally hired to do that they never created seven years ago. I just keep hearing God tell me that He is going to bless me and He has been. In the meantime, I need to focus on my daughter and finishing up some of the redecorating I had started in my house. I feel this strong compulsion to not just declutter but to minimize the amount of things we have, as in if we have not used it or do not use it, it needs to go. I am going to be posting lots of homeschool materials, but I plan to keep some things...there may be grandchildren some day that will use it, even though the Princess sounds like me at her age and has no desire for children, she says. Now, this is EXACTLY the cat I have always wanted for myself and the farmer did not want it, so offered him to us for free. I had promised myself that I would not have another indoor cat, but my husband said that he would not be mine. That was two days before Christmas so my husband and I made him a surprise last minute Christmas gift to the Princess. When we returned home, my husband got the rabbit settled into her quarantine cage while I combed out the cat, and then we were off to the pet store because we no longer had anything for an indoor cat. 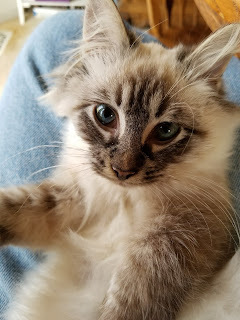 I wanted to name him Lynx from the moment I saw him, but the Princess was between Trevor and Link for a couple of days, finally deciding on Link. My husband calls him the Linkster and I keep tripping over not calling him Lynx (or spelling his name Lync at the very least). Come to find out, after an hour of searching on the Internet, he actually is a Seal Lynx Point Balinese. Not kidding. How is that for being blessed? The Princess calls him her child, but that is my lap in the picture. He is an equal opportunity kind of cat and will even snuggle with my husband. When you pick him up, he goes completely limp. I have had a lot of cats in my life, but none that did that. So, the rule is the Princess is not allowed to leave home with him....not really, but he is super adorable. I guess these are the kind of sacrifices a mother makes for her cat-loving child. Thank you, my Lord, for your blessings that have been falling freely upon my family as well as me. Your promises are promises kept. I will discuss the cat [obviously]. He is super gorgeous & I think someone has muddled their cats. He looks like [blue eyes, points, fluff] a ragdoll ~ & that tendency to go limp is certainly a ragdoll trait. I think they are the only breed that does that so even if he is not a purebreed I would bet there is ragdoll in his genetics somewhere. Also their coats don't matt. The limp & nonmatting are what gave away some of my lads breeding as they don't look particularly ragdollish. Having said all that I looked them up so do not know about the going limp thing. It's a wonderful cat trait if one has children & it doesn't matter. He is beautiful! Now I shall have to skype & tell him so! He's eyes are not the true blue of a Siamese as he has some green tones in them. If I could order a cat made for me by God, this would be that cat. Absolutely beautiful! I think you are right. He is at least part Ragdoll. He does not jump high and climbs more as well.